(1) A planet is a celestial body that (a) has sufficient mass for its self- gravity to overcome rigid body forces so that is assumes a hydrostatic equilibrium (nearly round) shape, (b) is the dominant object in its local population zone and (c) is in orbit around the Sun. (2) A dwarf-planet is a celestial body that (a) has sufficient mass for its self- gravity to overcome rigid body forces so that is assumes a hydrostatic equilibrium (nearly round) shape, and (b) is in orbit around the Sun. 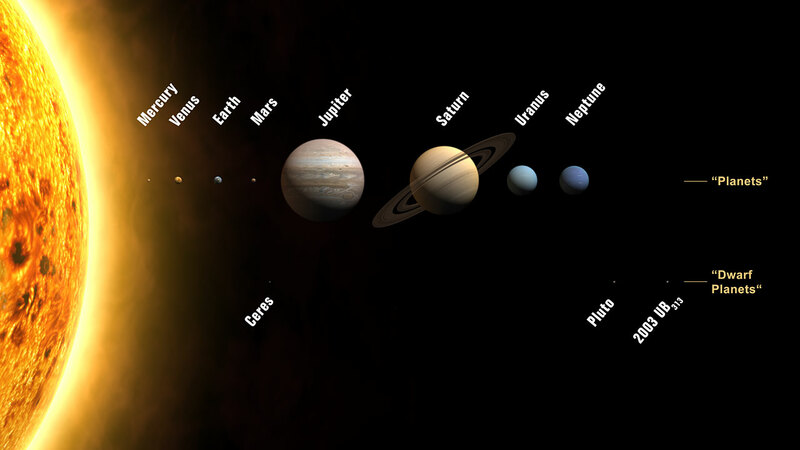 (3) All other objects orbiting the Sun, including most of the Solar System asteroids, near-Earth objects (NEOs), Mars-, Jupiter-, Neptune-Trojan asteroids, most Centaurs, most Trans-Neptunian Objects (TNOs), and comets, shall be referred to collectively as "Small Solar System Bodies". In the new nomenclature the term "minor planet" is not used. An AIU process will be established to assign borderline objects into either dwarf-planet and other categories. Pluto is a dwarf planet by the above definition, as are one or more recently discovered large trans-Neptunian objects. Dwarf-planets that have orbital periods in excess of 200 years are designated this category of planetary objects, of which Pluto is the prototype, as a new class that we call "plutonids".